Not all major languages are supported yet with Siri translation, and currently Siri only can translate between English, Spanish, French, Italian, German, and Mandarin Chinese, but it’s probable that other popular languages will debut in the future. Notably absent are the other major global languages with hundreds of millions of speakers, like Portuguese, Bahasa, Hindi, Japanese, Russian, Arabic, Punjabi, Korean, and others, but it’s quite likely translation capabilities for these other languages will arrive with future Siri updates and iOS versions. Well I’m definitely no Mandarin expert, but don’t questions in Mandarin always end in ‘ma’ indicating a question? No ‘ma’ where expected! Specifically, it has to be American English. Oddly, it won’t translate from Canadian or British English yet. yeah, I’ve known of this feature since 11.0 went public, yet “It won’t translate Canadian English”. It get’s my dictation 100%, word-for-word. Yet, it replies with that error. Very frustrating. It literally has the correct words in text form – just translate that. But no. And it’s only from english, not into english from any of the other available languages. By the way, when the author of the article listed the languages into which Siri can translate (German, French, Italian and Mandarin Chinese), he forgot one: Siri can also translate into Spanish (pronounced in Castilian style rather than Latin American). Hopefully the German average translation is a little better than the examples, that would be in correct German: „Ich möchte das Hühner-Schnitzel bestellen.“ – Schnitzel is not „die“ but „das“ and Viener is spelled „Wiener“ after the capital of Austria, Vienna, in German „Wien“. 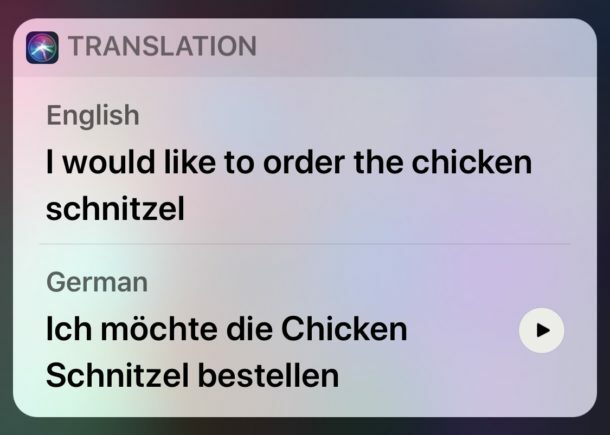 chicken translated to german as Chicken is an absolute flop. I’ve tested with spanish and no, it’s not alwys the best transtation. Also noticeable, the spanish translations are usually read using castilian (Spain) spanish pronunciations rather than Latin american. For example it will read ‘Gracias’ (spanish for thank you) as grah-thee-as (Spain pronunciation) as opposed to grah-see-as (Mexican and Latin American pronunciation). It would be easier to learn a foreign language than to understand a Siri translation…………. Yeah. In spanish, for example, they chose to have Siri read the translations with the pronunciation used in Spain. While that is not by any means incorrect, it would certainly feel kind of weird if used while traveling in Mexico or other countries in Latin America. The Chinese translation is actually completely wrong. It didn’t translate iPhone X correctly. Siri has a hard time with rural American dialects. I asked Siri “Y’all gon git up der crik ta warsh up? Ain’t ya?” and it just searched the web for me for some gibberish. So apparently some of the American Rednekonics language is just too challenging, but Siri did seem to figure out the Midwestern dialect of adding “dontcha know” and “eh” to the end of every sentence, eh. I suppose Siri expects Americans to speak in civilized tongue to translate efficiently to other civilized languages. Yeehaw! I seem to remember in Douglas Adam’s books (Hitchhiker’s guide to the galaxy) there is a Babel fish which placed in the ear translates any language to the user’s. Siri is now a babel fish. Siri, won’t translate from Australian English. Any idea when this could happen? You could always change your iPhone or iPad to be American English as the language, then it would translate just fine. For a long time I had mine set differently so I could enjoy the accents of Siri, but then you can now change the Siri accent without doing that. Absolutely bloody useless. Just tells me it can’t translate from my (very refined) English accent. What a waste of space. I just discovered that I can’t use the work around on my old ipad ( to translate sites written in another language) on my brand new ipad. You have to download a couple of Bing apps. One of them is not available in Canada (but is available in the US). This is extremely bizarre. Pretty discouraging to put out for a new iPad and find out it can’t do things your old one could. I never use Siri. When I get asked to talk to robots on the phone, they never understand me. My iphone has never even once recognized my fingerprint. The ipad, maybe ⅓ of the time. Unable to translate from British English yet, what is that all about! LOL, but tell Siri I’ve had chicken schnitzel before, explain that! The Real Wiener Schnitzel is from calf! In the UK – Siri is not yet able to translate from British English. I confirmed this today and that was the message. Siri translates my cat’s meows and we now have quite lenghty, meaningful conversations! No Japanese?!? Siri is dumber than I thought. Won’t work from French to any L.
Siri say, change your main language…. Propably Iphones are made for US only…. Come on Cupertino – get your poop together. Siri told me she couldn’t translate from Canadian English yet???? Any idea when other language support will be available?